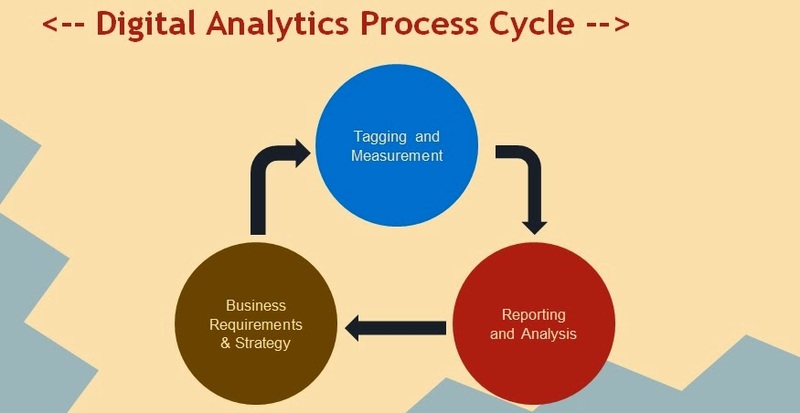 So here is the process cycle I would prefer to have for any standard Digital Analytics engagement. For any Digital analytics consultant it is very important to understand the client's business and their requirements first. If the client is not well aware of the kind of metrics he want to see, you as a consultant can always analyze their business goals and come up with some Key Business Requirements which match up their goals. Once you have your Key Business Requirements in hand it's time to come up with Key Performance Indicators your business would be interested in. When I say Key Performance Indicators it can vary from business to business. What do you mean by Key Performance Indicators? The name itself tells you all, these are the Key Indicators which tells you about the performance of your business. For example an e-commerce business would like to know about how many people have purchased a particular product rather than how many people have visited their home page. Of course they also want to know how many people have visited their home page but they would be more interested on sales. Similarly if you are a blogger you would be more interested to know about the engagement on your site. So depending on the type of business, the Key Performance Indicators would differ. Once you are clear about your KPIs in short, the next task would be to convert these KPIs to more plausible Web Analytics tool variables. Why? A web analytics tool is just a platform which spits out the data you collect on your web channel in some predefined graphs or formats. Most of the web analytics tools comes with some cool out of the box reports which gives you a whole lot of information about the number of visits, page views, average time on site and stuff. But you will not know how many people have clicked a particular button etc. Keeping that aside, once you have your KPIs, you need to come up with a set of variables related to your web analytics tool. If you are implementing Google Analytics you can select the needed Custom Dimensions, Metrics and Events to fulfill your KPIs. If you are using Adobe SiteCatalyst or Omniture you can use props or eVars or events to fulfil your KPIs. This step is popularly called as Solution Design. Most of the people prepare a document assigning variables for the requirements giving all the details. They call this document as Solution Design Document. With this your First step in your process is completed. Once you have the Solution Design document in your hand, it's time to prepare a technical implementation document giving directions to your developer to implement whatever the design you have come up with. This is the traditional way of tagging. With the advent of Tag Management systems, you don't need a developer to do this. You can very well implement the solution design all by yourself. In this step, again we have different sub steps namely the Implementation, Unit Testing of the code you have written, Tag Testing. This completes the implementation stage. Once the tagging is complete, the data should start flowing into your Analytics reporting interface. At this point you can do the functional testing and see whether appropriate data is being collected or not. If at all there are any mistakes in any of the Testing process you need to modify your implementation code. Once everything is done you can enjoy the data that's coming up on your profile. You can build custom dashboards, custom reports and segments and do all the combinations you want to and enjoy the visualizations. The amount of insights you generate from the data that's being collected is solely based up on your Analytical capabilities and your understanding on the business. If you clearly observe the chart I have given above, it's a cycle. Why? Because let's say you have completed all the three stages described above and after seeing the data your team might come to a conclusion that this is not the way you wanted the data to look like. So you go back to your basics and modify your strategy there by modifying your tagging and finally the data that comes to your reports. So, I hope the process is clear, if you have any questions or any suggestions please do comment below.